So, I know that the Brits are famous for talking about the weather, but please forgive me this once.. Three seasons in as many days!??!?! Today was grey, drizzly and dull. The sunshine of yesterday was long forgotten and positively autumnal weather has taken over! The day before yesterday was winter, yesterday was summer, and today autumn, when is spring going to arrive!?!?!??! Ehem….moving on… Because of today’s greyness I didn’t really have much incentive to leave the apartment, so I stayed in and did some work for a few hours and then at around 2:30 I left, I ate lunch in the flat in an attempt to reduce my costs and then caught the tram into town. I got of a stop or two before Centralny today and walked East, past various forms of architecture, new, old, decaying and decayed and found my way to Marszalkowska, the main traffic street in this part of the city. I just sort of wandered for a while, the drizzle hitting my face despite the umbrella. Eventually I found my way to Raster, one of the more independent and contemporary galleries in town. 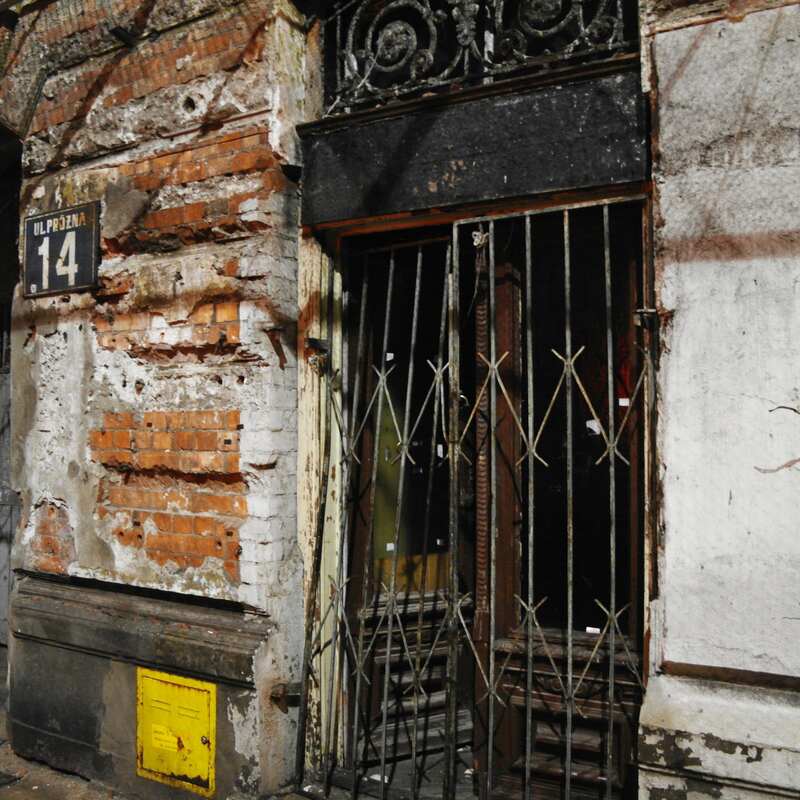 It is hidden a little way along Wspolna Street, number 63. 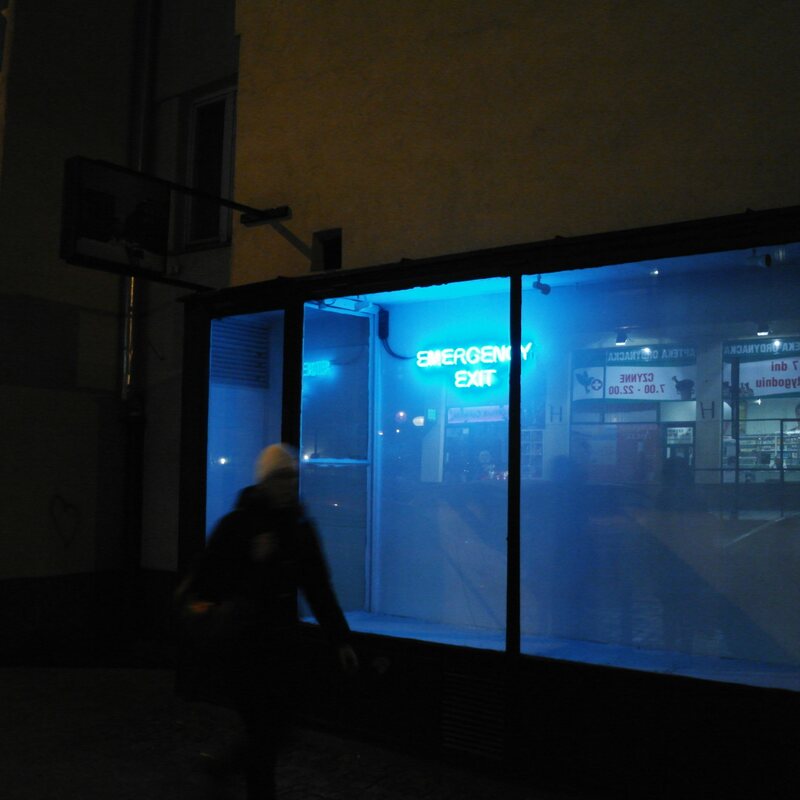 They are currently showing a piece by Michał Budny called Zywica. He had spent some time installing the piece, playing with different compositions and designs of the space and has landed with a superbly minimal and interesting work. Sheets of polythene hang silently from the walls, a plastic covered square piece sits above the lintel like a clock, the noisy door opening and closing with a bang and screech. It was a work I couldn’t quite get hold of to begin with, I think because I have seen so many noisy and chaotic pieces lately, but I spent some time in the work and it began to evolve, and the atmosphere developed over time, people entering and leaving the space, the receptionists light keyboard tapping, the temperature. That done I decided I needed a sit down, I thought there might have been a cafe in the gallery but alas there is not. So I headed for the old town, walked past a cafe that looked OK but carried on in the hopes of a cozier looking place, but this never happened, so I came around in a loop and went back to the first place I had spotted. I took a seat and ordered a hot ginger, lemon and honey drink and sat and wrote on the back of a press release, trying to figure out the next step of my journey. A little while later, at around 6:45 I met up with Marta and we wandered to yet another part of Warsaw that I had still not discovered. This is the old Jewish district. There is one street that still has some of the old buildings that date back to before the war, and are still potted with bullet holes and some still have their old shop signs. The street, which is now ghostly and silent was once the bustling heart of the district and is now in ruins. The buildings had been left as some sort of document of the past, and also because of anyones reluctance to renovate, it seem that now there is some kind of work going on, one side of the street is blocked off by steel fencing and there is a crane and building materials dotted about. This place is also where they apparantly filmed The Pianist, the film about a Jewish man who managed to evade capture by hiding out in the Warsaw Ghetto. We went into a little cafe that sits on the end of one of the buildings, somehow managing to survive in the crumbling tenement block. Called Cafe Prozna (on Prozna street), this is a nice little place with wooden tables and chairs, though very modern in style. We ate some food, Marta had a sorrel soup whilst I had a tasty quiche with salad. I enjoyed the food though Marta wasn’t very impressed with her soup. We then went for a walk in the dark, but multicoloured city lights, ending up in the original Wedel chocolate cafe. The walls are decorated with paintings and old photos, the building itself is capped with a big illuminated Wedel sign, so it is pretty hard to miss. I decided that it was dark enough and cold enough to justify having a hot chocolate with rum, whilst Marta had the traditional chocolate. She has lived in Warsaw for basically two years and this was her first time here!!! CRAZY! It is a nice little place, and the chocolate is really great. There was a very good helping of rum in mine and it did the perfect job, chocolate high with a rum filled edge… We sat there for a while chatting and talking about what Marta will do now she has resigned from her job and then we decided to walk around the city some more. The drizzle had abated a little and we walked back towards Nowy Swiat. 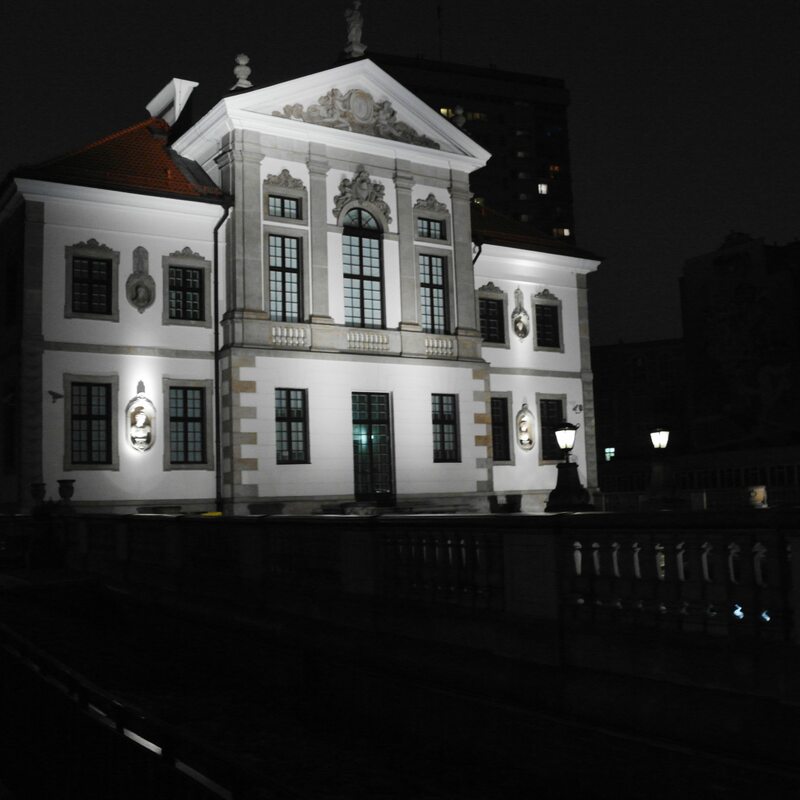 Then further East to outside of the Chopin Museum (today was his birthday and there are various things happening, many that seem to involve carrying around Polish flags…) The building is all lit up at night, like most of the famous and big buildings in the city. From there we walked across a footbridge and down a staircase and then down onto Dobra Street where we walked South towards the railway and tram bridge (Poniatowski Bridge), then along the side of this bridge, up the staircase and back into the city centre. We caught a tram home and got in around 11pm.